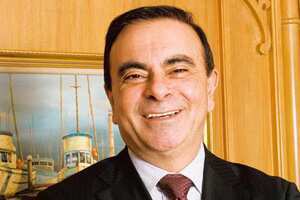 New Delhi: As the world’s third largest auto player, the Renault-Nissan alliance has had a successful run. But its presence in India has been on the fringes at best. Chief executive Carlos Ghosn intends to reverse that and took time off from his activities at the World Economic Forum’s India Economic Summit to meet with his joint venture partners. His ultra low cost car with Bajaj Auto Ltd remains on track for a 2012 launch and Renault plans to introduce more models into the Indian market. He also promised to deepen his engagement with India and visit again in March when the first vehicle rolls out from Nissan’s facility in Chennai. Earlier today (Tuesday) you clearly articulated what you’ve been saying all along—small cars, least expensive. Seems like a big vision statement from you. I understand that the media was a little impatient. And I’m told that the length of time it was taking was a sign of trouble, which it was not. It was a sign of really making sure that we had a solution that both partners agreed was (the) best one. The roles and which party will be doing what have been clarified and I’m taking this opportunity of being in India to make sure we have a clear statement about how our collaboration with Bajaj will be going. And hopefully, this answers a lot of questions coming from the media and for us it’s answered a very important question about what is our entry point into the Indian market. You mentioned making clear what each partner does. What exactly would each partner do? To summarize: all the part which is design, engineering and manufacturing of the car will be mainly Bajaj’s responsibility, with the support of the Renault-Nissan alliance. The marketing and sales side in and outside India will be our responsibility, with the support of Bajaj. We made it very clear about who is going to be doing what. I understand from Rajiv that he’s doing very well in two- and three-wheelers. I envy his Ebitda (earnings before interest, taxes, depreciation and amortization) margins and so I understand when he says he wants to concentrate on this segment. Isn’t it a risk to tie up with a company that has primarily been a two- and three-wheeler maker so far? They’re not doing it alone. They’re doing it with our support. Bajaj has skills and a mindset that we don’t—frugal product planning and frugal engineering—which are absolutely essential for the success of a product like this. We obviously have the knowledge and experience of how to make cars but we need, in order to be successful, to have a team of engineers and team of product planners that are passionately designing to cost. If you don’t do that, you’re not going to be successful in delivering what we hope will be the lowest price and the lowest running-cost product. There’s been intense speculation about your tie-up with Mahindra to manufacture and market the Logan. What have you learned from that experience? The Logan is a good car. All the people who bought the Logan in India are very satisfied with it. The only problem we have, and this is not a customer problem, is that the sales of the Logan are not at a level we’ve been expecting and we are trying to understand why the Logan has been such a success in Russia, Eastern Europe and North Africa and Brazil and why in India it’s been so limited in sales. We are addressing this situation. There are a lot of explanations regarding the price, the tax incentives for cars below 4m in length. This is a very price-sensitive market and a difference of 5% in pricing can make a big difference. We have plans to revamp the Logan. The strategy of Renault is not to be limited to one car for the Indian market. We now have the intention to have a full product line-up. As a potential competitor, what is your assessment of Tata’s ultra low cost car? I don't talk about competitors. I was the first one to say when the Nano was announced, who took the Nano seriously. I think it is a good concept and it corresponds to a need especially in a developing market. I am not taking it lightly. Is the ultra low cost car being made in collaboration with Bajaj your version of the Nano? Too early to say. You’ll see when you see the product. I think it is going to be a different product from the Nano but it will address the same concern—low price point and a much better fuel consumption than anything in the market today. In the past year or so, more small cars are being sold in the developed world than ever before. How will this shift affect the profitability of auto makers? Small cars are not by definition unprofitable. Car makers did not think that it was absolutely necessary and crucial to make small cars profitable. All those dealing with small cars are very profitable but others did not think it necessary to build their profitability around small cars. But now that everybody is getting conscious about the fact that small cars are a very important part of the picture, particularly because most of the growth is going to come from emerging markets...car makers are going to have to get back to the drawing board and ensure that every single small car they build is going to be profitable. That’s one of the reasons why we’re building our ultra low cost car in collaboration with Bajaj. Renault-Nissan is also working on alternative-fuel cars. How are your efforts in this area progressing? We have hybrid cars but we’re not leading the pack. We’re in the middle of the pack. Where we want to establish a leadership is in the zero-emission cars, so we’re taking a lot of initiative and spending a lot of money to be the technology leaders in electric cars. We’re taking very concrete steps because we’re building a 500,000 unit capacity both in battery and cars worldwide, in Japan, Europe and the United States. So it’s going to be difficult to take leadership from us as there is no capacity for the moment and if electric cars really take off we’re going to be the dominant player in the beginning. So, our strategy is clearly leadership in the mass marketing of affordable electric cars and also be a global manufacturer of hybrid engines and also to fine-tune the internal combustion engine. Rajesh Mahapatra is with Hindustan Times.